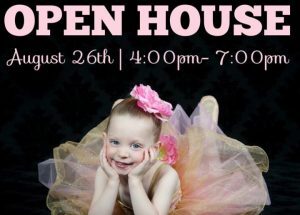 Encore Dance Academy is having an open house at their facility at 335 Main St. on Friday, August 26 4:00-7:00pm. They will have demonstrations, giveaways and more! For more information about the studio visit their website. Colonial Chorus is holding auditions for their fall production of “Forever Plaid” on Sunday August 28 at 5:00 PM and Monday August 29 at 7:00 PM. All those interested in auditioning should bring sheet music in the style of the show and be prepared to sing 16 to 32 bars of music. In addition to singing, be prepared to tell a short comic story in a sincere, innocent manner. 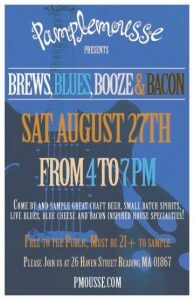 Pamplemousse is hosting an End of Summer Hootenanny “Brews, Blues, Booze, and Bacon!” on Saturday, August 27 from 4:00-7:00pm. Come in and enjoy bacon and bleu cheese inspired foods, taste drinks from Rumson’s, Deacon Giles, Coole Swan, Copper & Kings, Downeast Cider, and craft beer, and listen to a performance by blues guitarist Qwill, from Salem, MA.